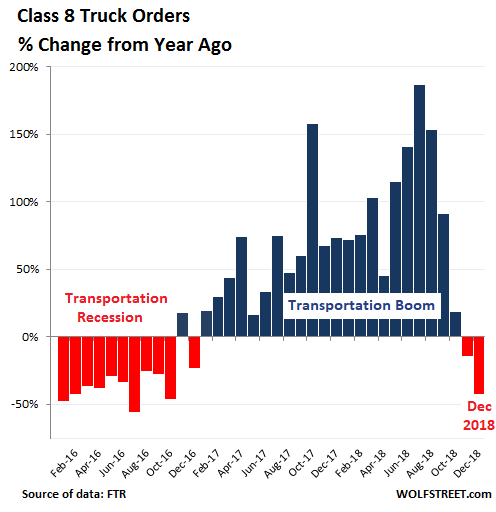 The impact of the “transportation recession” in 2015 and 2016 when Class-8 truck orders plunged to the lowest level since 2009. This entailed layoffs at truck and engine makers. The subsequent boom in orders in 2017 and 2018, when demand for transportation services soared, and trucking companies found themselves short on equipment. This boom in orders led to a record backlog for truck makers and their suppliers. And since fall 2018, the next phase in the cycle. The trucking business is very dependent on the goods-based economy. Late 2017 and through much of 2018, demand for transportation services, such as shipping by truck, was very strong for a number of reasons, including a strong goods-based economy with booming e-commerce, a buildup of inventories, companies trying to front-run potential tariffs, etc. Freight rates spiked. As shippers struggled with higher costs and delays, truckers ordered new trucks to meet the demand. Truck makers were swamped with orders, and their backlog balloon to 11 months at the peak. Demand for transportation services continues to be strong, but just not as strong as it was. And trucking companies are adjusting. 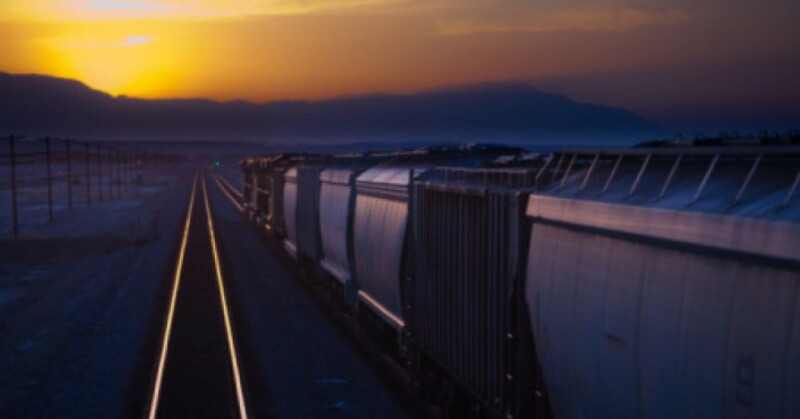 Their fear is overcapacity, which entails plunging freight rates, which is precisely what occurred during the transportation recession of 2015 and 2016. Over the past 12 months as of December, truckers ordered 482,000 Class-8 trucks, according to FTR data. 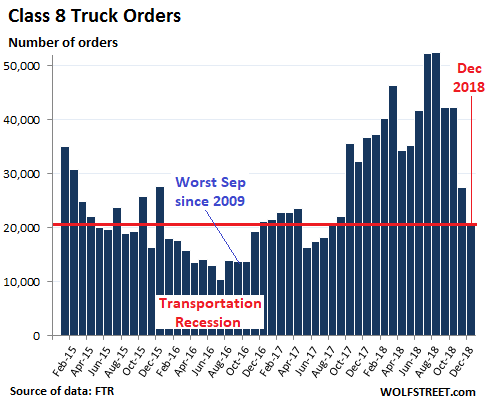 And truck makers are still working through the large backlog. The annual capacity of truck makers in the US is about 320,000 Class-8 trucks per year. This averages out to about 26,500 per month. So the orders in December were 21% below that level. In addition, there have been some cancellations. But the current backlog still extends deep into this year. Freightliner and Western Star owned by Daimler. Peterbuilt and Kenworth owned by Paccar [PCAR]; shares are down 25% from a year ago. Navistar International [NAV], shares are down 40% from a year ago. Mack Trucks and Volvo Trucks owned by Volvo Group, the Swedish manufacturer of trucks, buses, construction equipment, and marine drive systems, not affiliated with the automaker Volvo). The cyclicality of the trucking business is legendary, bouncing between over-capacity, dropping freight rates, and plunging orders for trucks to equipment shortages, soaring freight rates, soaring orders for trucks, supply-chain bottlenecks, and shipping delays. And everyone in it ends up having to ride it up and down. So this doesn’t come as a surprise, after the blistering boom through the summer last year. It’s just the beginning of another phase in the cycle. This entry was posted in Business, Economy and tagged Trucking. Bookmark the permalink.